Are you looking for a grammar school place for your son in September 2019? Welcome to Your March Issue. 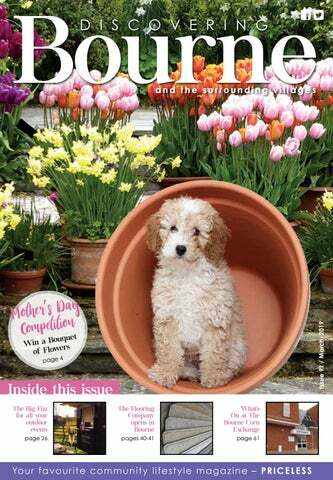 Welcome to our March edition and a subtle reminder that it’s that time of year again when you can shower us mums with all those lovely words, cuddles and flowers! (Sunday March 31st, as if you’d need any reminding!) The new addition to our family, George the adorable cockapoo, has already showered me with Valentine’s Day goodies, so I might be in luck again. One very clever dog! Spring arrives this month of course - a time for freshening things up and putting new things in place for the longer and warmer days to come. Enjoy them, and thanks for the lovely feedback coming our way from you, the readers. Continuing, big thanks to all of our contributors and advertisers as well. Don’t forget…. clocks “spring forward” one hour on Mother’s Day. Soon be summer!!! Another month, another issue, bulging with information, features and advice. Read about health issues, money-related and legal matters, gardening tips, computer advice, St Lucia for the sunshine, veterinary advice, our comprehensive events and gigs guide for the month and a very special Mother’s Day quiz, focusing on that very special lady. Talking of which, there’s even an opportunity to win our competition with its Mother’s Day theme. Variety is indeed the key! Just a thought … by the time a woman eventually realizes that her mother was always right, she has a daughter of her own who thinks that she’s always wrong! And finally … I’ve just developed ‘sausage-phobia’ – I fear the wurst. She said, “Nothing rhymes with orange”. I said, “No it doesn’t!” Enjoy the read! 15.............. New dental clinic opens in Peterborough. Practice. 22............. The Travel Column – St Lucia. 23............. “Strictly on Tour” review of Shaws Coaches trip. 24/25..... Community Matters. 26............. The Big Fizz Mobile Bar feature. 28............. Words from the Mayor. 32............. Special Mother’s Day Quiz. 34............. The Potting Shed – gardening advice. 36............. Green Thumb feature. 38............. Legal Corner – Purchasing property in joint-names. 44............. Your Finances with Liberty Partnership. 46 ............ Discovering … The Red Hall. 50............. Safe Local Trades – Scammers beware! 58............. The Technology Site – Use WhatsApp on your PC. 60............. Riverside Beads, Market Deeping, feature. 62/64..... What’s On – Events and gigs guide. 65............. Schools News. 66............. Pets and Vets – Blood testing older pets. 72/78..... Classified businesses directory. Why is you Mother so special? Spoil your Mum this Mothers Day with a beautiful bouquet! ROSE RADIANCE FACIAL Using advanced, specialised products, this targeted facial provides expert response to the needs of every skin type. This intensely soothing treatment will reveal a more even, smoother skin. Designed to be suitable for even the most sensitive of skins, Damask Rose essential oil and the cooling chamomile mask will leave your complexion clear, relaxed and more resilient to stress, medication, environmental aggressions or simply general fatigue. Prepare to reveal a more radiant, even and smoother skin! The classes make me feel ten years younger! substantial before you reach for those fattening snacks. Try using frozen vegetables to save time and money; they are also great for making quick and nutritious soups. Create a weekly meal plan and a fat-loss-friendly shopping list to do your grocery shop on-line. This will save you time and money, as you won’t be tempted to impulse buy and it will keep you right on track with your goals. Renu are looking for full time or part time Beauty Therapist. To apply for this position please email claire.saunders@renu.uk.com. Join our ladies gym for just £20 per month Includes unlimited virtual spin classes and free access to our member zone “6 steps to success” programme. All this for only £175! any of us will have the misfortune of suffering from lower back pain at some point in our lives. It is very common and can occur very suddenly or in a more subtle manner. It is, however, always inconvenient, badly timed and can never go fast enough. It is also something I see professionally most days in practice. One thing that has become clear after assessing multiple patients with the same problem is that a large majority will have sustained a back injury at some point earlier in life. Many felt that they had recovered from the original injury, but there is often a little stiffness and restricted movement that remains, (often assumed as the new ‘normal’ or being age-related).A common cause of this is from the adhesions, or in other words internal scar tissue, which can be found at the site of the injury. These adhesions can ‘bind’ the various layers of muscle, fat and connective tissue which, in turn, limits their natural elasticity and smooth movements causing varying degrees of limited movement and, in many cases, pain. Research has shown that these adhesions are typically weaker, less elastic, prone to re-injury, and are more sensitive to pressure than healthy tissue. The result could be a reduced tolerance to some of life’s everyday activities and, in time, more persistent pain that lingers years after the initial injury. The good news is that, in many cases, these adhesions can be broken down and healthy function restored to the injured area. Recovery time will vary of course, for example, depending on the amount of adhesions and how long ago the initial injury occurred. In fact, some professionals believe that adhesions are the root of the majority of physical imbalances. Working on the body to address adhesions early in their development can help minimise any of the preceding secondary problems. Sports massage can be an effective way to tackle this problem and restore healthy muscle function. If you would like to know more, or to see if I could help fix your recurring problem, then please contact the Wellhead Practice for more details. I practise here, three days a week, offering thirty or sixty minute consultations. BODY CONFIDENT BY EASTER 3D LIPO FAT FREEZING Fat Freezing or Cryolipolysis, can selectively target troublesome areas of fat such as muffin tops, love handles, bingo wings, back fat & thighs. Add 3D Shockwave to dramatically Flawless Faces, 17 / 18 Scotgate, Stamford, PE9 2YQ accelerate results. 3D LIPO BODY TREATMENTS We provide a combination of advanced technologies enabling us to offer a complete & prescriptive approach to help with overall circumference reduction, skin tightening & Flawless Faces, 17 / 18 Scotgate, Stamford, PE9 2YQ cellulite reduction. We are always striving towards being as ethical as possible regarding the use of chemicals being ecofriendly and animalfriendly. For many years now, we have used Sensus MC2 colour for this reason and, over the past few years, it has become vegan-friendly too. Their mission is eco-sustainability, both environmental and social. Being within the reach of all, offering gentle, yet effective, green formulas - professional quality at accessible prices. We love the facts about • The bottles are made from PET which is sustainable, non-toxic and 100% recyclable. • 96% derived from natural, organic ingredients and VEGAN-FRIENDLY. • Anti-animal testing, SLS, paraben, silicon and allergen fragrance-free. • Nickel tested; important because it has been associated with contact dermatitis and even asthma. Even the most sensitive skin has less chance of being irritated. • As well as this, your hair will feel amazing and will not cost the earth! For more information, speak to the team who will be more than happy to advise on the best products for you. The 1:1 Diet by Cambridge Weight Plan I have struggled with my weight for many years, yo-yoing and losing and gaining the same couple of stone over and over again, on so many different diets. In October 2018, I finally decided that enough was enough and I needed to shift the weight for good. I decided to try something a bit different and chose the 1:1 Diet by Cambridge Weight Plan. Finding help was easy; I simply looked up my postcode on the Cambridge website and chose a consultant local to me. For the first time I’d found a diet I could stick to, a diet I enjoyed and a diet that worked consistently and quickly. I’m happy to say that in a few months I achieved my goal and I feel fabulous, confident and successful. I was so taken with the diet and the way it worked for me that I have trained to become a consultant myself so that I can help others achieve the same success that I did. KATE BEFORE cambridge weight plan consultant, your journey, your success! I’d love to be the one to support you on your exciting road to a healthy, happy new you. If you’d like to know more, please get in touch. invasive dentistry, and also prevent future oral health problems. Richard is an innovative and expert orthodontist with a reputation for achieving excellent results in even the most complex cases. He was the lead consultant orthodontist at Peterborough City Hospital from 2001 to 2017, and is one of the few consultants in the UK to hold a national Clinical Excellence Award. The couple are joined by consultant oral and maxillofacial surgeon, Mr Clive Moss, who provides a private, patientfocussed oral and facial surgical service, such as the surgical removal of wisdom teeth. For more information or to book an appointment, contact the practice team on 01733 865000 or visit www. priestgateclinic.co.uk . Smile with confidence We’ll give you the smile you’ve always wanted Local dentist Catherine Cousley and Richard Cousley (Consultant Orthodontist) are delighted to announce the opening of The Priestgate Clinic in the centre of Peterborough. Our Extraordinary and Adaptable Brain The importance of brain plasticity Our amazing brain is continually moulding and modifying itself to our environment, events in our lives, words, feelings and the people around us. Without this ability, any brain, not just the human brain, would be unable to develop from infancy through to adulthood or recover from brain injury. Our brain is so exceptional because, unlike a computer, it processes sensory and motor signals in parallel. It has many neural pathways that can replicate anotherâ&#x20AC;&#x2122;s function, so that small errors in development or temporary loss of function through damage can be easily corrected by re-routing signals along a different pathway. Different pathways form and fall dormant, are created and cast-off, according to our personal experiences. So this vibrant process allows us to learn, develop and adapt to our ever-changing experiences. Every time we learn something new, we create new connections between the neurons and this is happening to all of us, all the time. This process can be encouraged and stimulated, allowing us to learn, relearn and direct our lives, thoughts and behaviours creating exciting possibilities. This process can be so useful to us, enabling us to re-invent ourselves, move away from our current state of things, or to overcome past traumatic events which create anxiety/stress or depression and fears. This leads to avoidance behaviours which hold us back from living life to our fullest. By learning how to adjust our thought patterns and behaviours, Solution Focused Hypnotherapy helps you to create the changes you want in your extraordinary brain. If a person believes he or she can get smarter, better or more skilled at something through sustained effort, this is how neuroplasticity works, enabling us to purposefully rewire the brain to achieve what we really want. Learning a new language or a musical instrument works in this way, no matter what the age. The degree to which we apply the brainâ&#x20AC;&#x2122;s near-magical abilities is also dependent on how committed we are in encouraging neuroplasticity and how we approach life in general. Solution Focused Hypnotherapy can help you rewire your brain to make the best version of you. Choose from either a Glamorous Gel Polish on fingers or toes, Eye brow wax/tidy and tint OR Tropical Back Facial to include a sea-salt exfoliation, relaxing massage with heat and a therapeutic scalp massage to finish - for only £35 each Mother & Daughter Duo Make-up Lesson To guide and advise you on correct make-up application and to give essential hints and tips along the way ! £40 each Gift Vouchers are available for all treatments or for monetary value. Treat Your Mums to a ‘Soul to Sole’ Experience this Mother’s Day Package includes a Indian Head Massage, Facial and Traditional Thai Foot Massage. Choice of a freshening drink and cake during their treatment. Experience this calming treatment for only £65! St Lucia is a blanket of lush forest, emerald-cloaked mountains and palm-fringed beaches crowned by the magnificent Pitons. It’s regarded as one of the most beautiful islands in the Caribbean and one of the world’s most romantic destinations; St Lucia has long been a favourite with couples and honeymooners. Plenty of Activities Gros Piton Hike The Pitons are perhaps the most iconic image of Saint Lucia, and the summit of Gros Piton showcases the island in all its glory, with spectacular views of its lush rainforest landscape and blue Caribbean Sea for miles. Visitors can embark on a half-day hike of Gros Piton, but at an impressive 2,600ft high, be warned that this hike is not for the faint-hearted! Whale and Dolphin Watching Boat Tour Pilot whales, sperm whales and spotted dolphins all call the local waters home. See these magnificent creatures in their natural environment on a fun-filled boat trip. You’ll also have plenty of opportunities to see some of the island’s otherwise hidden spots, including Marigot Bay, and view the Pitons from the sea. Segway Nature Tour Taking you through the nature trail of Mount Primard, this unique experience allows you to try something new, whilst still learning about the island’s history. The Segways are safe and easy to navigate and don’t worry, you’ll have a twenty-minute orientation/practice session to get the hang of it before heading out on the trail. I-Tal Experience at BodyHoliday Enjoy an organic farm-to-table experience at BodyHoliday, leaders in wellness and sustainability in the Caribbean. The I-Tal experience is a blend of Rastafarian culture and modern, sustainable farming. Pick your lunch and learn about the agriculture and West Indian plants, before heading up to the wonderful dining area. Help the chefs chop and slice the ingredients you have just picked, before settling down to a healthy, nutritious and delicious vegan meal, lovingly prepared in front of you. Fabulous Choice of Accommodation Sugar Beach, a Viceroy Resort - Set between the Pitons, this peaceful and luxurious haven showcases the island’s stunning natural beauty. This former sugar plantation has been transformed into a sleek and intimate resort, ideal for both couples and families. Rendezvous - A beachfront boutique hotel for couples looking to reconnect in an intimate setting. (Adult only). Perfect for relaxation, fine dining and fun. Enjoy candlelit dinners and couples’ massages; stick your flag in the sand for beach service or relax in one of the day beds in the beautiful rockery garden by the lazy river. BodyHoliday – Treat your body and mind to complete relaxation and rejuvenation at this unique wellness resort framed by forested mountains and sugar-white sands, with an emphasis on customising your experience with an impressive choice of sports, activities and inclusive spa treatments. With a complimentary fifty minutes’ spa treatment per person per day you can’t help but relax. (Guests over 16 years only.) Would you like to experience Saint Lucia? Get in touch with Clare Lockett to plan your holiday. “Didn’t We Have a Love … erly Time the Day we Went to Strictly?” Apologies first of all, to anyone not familiar with the 1979 hit single by Fiddler’s Dram recounting their trip to Bangor – hence the title. However, I’m sure we’re all familiar with the phenomenon that is “Strictly Come Dancing”. Here, our own “Dancing Queen”, Claire, shares with us her recent fabulous day out at the “Strictly Live Tour” date at Nottingham’s Motorpoint Arena on the afternoon of February 6th. Claire was accompanied by her mum and both were delighted to have been invited to travel in style and see the stars, courtesy of leading local coach travel and excursions specialists, Shaws of Maxey. From the moment their driver, “Jolly” Jason, welcomed them aboard, issued clear instructions and helpful advice, eased his coach effortlessly through heavy traffic to return them safely and in extreme comfort, the treat was a wonderful success. Highlights abounded, including a show-stopping dance from judges, Darcey Bussell and Shirley Ballass, (not as if Aljaz, Pasha and co. really need showing how it should be done). Joe Sugg proved a worthy winner on the day, whilst Ore Oduba compered beyond compare … and Craig just had to offer his suggestion on how the day went for Claire and her mum … FAB – U – LOUS!!! Claire is very grateful for having been given the opportunity of experiencing one of Shaws’ many day trips offered this year. They are many and varied and offer extremely good value for money. Why not treat yourself this summer? for ‘Lincolnshire Wildlife Trust – Bourne Area Group’). Details of all the Trust’s reserves and how to become a Trust member are available at http://www. lincstrust.org.uk/. Reserves in the area include Deeping Lakes, Dole Wood, Thurlby Fen, Tortoiseshell Wood, Stanton’s Pit, Robert’s Field, Toft Tunnel, Lawn Wood and Meadows and Horbling Line – with the first four of these being designated Sites of Special Scientific Interest (SSSI) due to their flora and fauna. The Bourne Area Group has, also, actively supported the Trust’s work at some neighbouring reserves such as the recently acquired Willow Tree Fen. These reserves cover a wide range of habitats from fen wetland to ancient woodland, with their associated plants, butterflies, moths, dragon and damselflies, birds, mammals, fish, and other species. The reserves in the Bourne area can be visited throughout the year, with a few restrictions due to periods of livestock grazing and breeding seasons. A Night to Remember with Jonathan Veira! Bourne Salvation Army would like to invite you to a special evening with Jonathan Veira on Friday March 8th at 7.30pm. The performance will take place in the centre of town at the Bourne Corn Exchange. When Carlsberg closed their Bourne depot in early 2017, the support that their staff gave to local charities at Christmas stopped. However, along with donations of stock from local supermarkets, (Lidl, Tesco, Sainsburys and Elsea Park Co-op), Toolbar was able to continue what Carlsberg started. In 2017 and 2018 they were able to give out bags of goodies to help make the Christmas break a little more enjoyable for some of those without jobs. An audience with Jonathan Veira is one not to be missed! If you haven’t seen him before, he performs all over the country with his extremely popular one-man concerts and has been a guest many times at the Christian Spring Harvest events. Jonathan uses his voice and his skills as a musician on the piano and guitar, together with his talents as a comedian. This show goes from opera to pop and includes jazz and even Country and Western along the way - everyone finds a song that they love in this show. Jonathan’s anecdotes and comments on life resonate with his guests which often result in great hilarity shared by all. Tickets are on sale from Bourne Salvation Army and are £10 each. Please contact us to book we are more than happy to do this for you over the phone on 01778 393459 or via e-mail bourne@ salvationarmy.org.uk. We look forward to seeing you there! The generosity of the stores involved is much appreciated by Toolbar, and it is hoped that they can repeat the exercise in the years to come. It may be possible that some stores will agree to offer additional funding through the year. Toolbar provides impartial, and independent, support and advice to those without work every Monday morning between 10.30am and 12noon, at the Bourne Snooker Centre. • Horse trials and eventing. • Winter food and drink markets. We can also tailor-make a bespoke drinks package specifically for your event. • Horticultural and agricultural county shows. • Polo, cricket and rugby matches. • Food and drink festivals. • The types of events we cover are: Festivals, Shows, Craft Fayres, Weddings, Parties, Christenings, Anniversaries, Corporate Events, Charity events etc. Take afternoon tea to your Mum or have it delivered. which you live or work, then the May elections could be for you. The areas of interest covered are all local, including environmental, transport, government finances, amenities, planning/ housing, community events and antisocial behaviour/ policing. To apply, you must be over 18 and meet the criteria for working or living in or near the town. If you would like to discuss the role of Town Councillor, or obtain more details of the criteria, please contact the Town Clerk on 01778 426123 or e-mail: clerk.bournetc@btconnect.com. Nomination papers are available at the Town Council offices from March 19th. • The Town Council has agreed the budget for 2019/20 to be levied by South Kesteven District Council. The rate will increase, for an average home in Bourne, by 3.8% from £27.36 last year to £28.44 for 2019/20. Returning to Brexit, (one more last time ... I think), a friend of mine heard that lots of big companies were planning to leave Britain as Brexit would be bad for business. He panicked. He relocated his bucket-and-spade shop from Skegness to Gstaad in Switzerland. Brexit has certainly been bad for his business. Bank Holiday Monday 22nd April Family Fun day, with Easter crafts and games for the kids and an Easter egg hunt. Family friendly menu. Mother’s Day Quiz All of the following questions are linked in some way to the most important person in anyone’s life – mum! According to the proverb, what is ‘the mother of invention’? 11) In which Beatles song does ‘Mother Mary come to me’? Which alcoholic spirit is affectionately known as ‘mother’s ruin’? 12) Who played Jennifer Saunders’s mother in ‘Absolutely Fabulous’? When does ‘Mothering Sunday’ take place in the UK? 13) Nacre is more commonly known as ‘Mother of _ _ _ _ _’? Who played the role of Frank Spencer in ‘Some Mothers Do 'Ave 'Em’? 14) In the pantomime, who is Aladdin’s mother? Which group’s fifth studio album was entitled ‘Atom Heart Mother’? 16) In the song, where was ‘Mother Kelly’s Doorstep’? In which Indian city did Mother Teresa found her ‘Missionaries of Charity’? What was the name of Superman’s mother? What was the name of the Greek King of Thebes who fell in love with his own mother? 15) Who was the famous mother of Liza Minelli? 17) If a horse’s father is a sire, what is its mother called? 18) Who was the last Empress of India? 19) What did Old Mother Hubbard find in her cupboard? 20) True or False – The first man on the moon, Neil Armstrong’s mother’s maiden name was Moon? 10) Who is Pebble’s mother in ‘The Flintstones’? ❀❀❀❀❀❀❀❀❀❀❀❀ ANSWERS 1) Necessity, 2) Gin, 3) The fourth Sunday in Lent, 4) Michael Crawford, 5) Anne Boleyn, 6) Pink Floyd, 7) Calcutta (Kolkata), 8) Lara, 9) Oedipus, 10) Wilma, 11) Let it Be, 12) June Whitfield, 13) Pearl, 14) Widow Twanky, 15) Judy Garland, 16) Down Paradise Row, 17) Dam, 18) Queen Elizabeth the Queen Mother, 19) Nothing, because it was bare, 20) False – the second man on the moon, Buzz Aldrin’s was! your bed and plant the crowns by digging a trench 12 inches deep and adding some well-rotted manure. Make a 4 inch ridge at the base and spread the roots of the crown over the ridge, replace the soil, leaving the tips just visible. Water in and add mulch. Don’t forget to leave the asparagus for two years before harvesting –it’s well worth the wait! Other jobs for this month include: •	Lettuces and other salad crops can be sown, either indoors or outdoors, under cloches or in cold frames. Tomato and cucumber seeds can be sown indoors but wait until the end of the month. •	Plant out onion and shallot sets. • Early varieties of carrot, beetroot, spring onions, peas, chard, parsnips, spinach and broad beans can be sown into the open ground. • Last chance for planting bare-rooted fruit trees and bushes. • Feed and mulch fruit trees –fertilise the base, water in and then cover with well-rotted manure or compost to act as a mulch. • Check cabbages for caterpillars and pick off. • Remove dead leaves from cabbages and Brussels. CREATING SPACE THE EASY WAY! We help utilise the lost space in your loft space with quick and affordable loft access and storage solutions. divided equally on a future sale of the property). When buying, you naturally don’t want to think about the possibility that you may break up. However, the sad truth is that it does sometimes happen. When “joint tenants” split up and have to sell, many of our clients say, “I wish I had taken your advice to hold as tenants in common”. Also, it is surprising how many people say that the option of owning as “joint tenants” or “tenants in common” was not explained to them when they purchased. This is one of many important aspects of a conveyancing transaction that can be overlooked. Thinking of moving? Call today for your "FREE VALUATION"
Disclaimer: This report is produced for general information only. Whilst every effort has been made to ensure the accuracy of this publication, Dataloft Ltd accepts no liability for any loss or damage of any nature arising from its use or from any changes made to Dataloft content by Inform users. Reproduction of all or part of the report in any form is prohibited without written permission from Dataloft Ltd. Report edited by Inform user and published on 2019-02-16. •	A higher rate tax payer £60 – tax relief of £20 will be given and an additional £20 claimed. Unless you really enjoy giving your hard-earned money to the tax man, I think it’s safe to say we would all like to pay as little tax as possible – especially if you are subject to ‘higher’ or ‘additional’ rates of taxation. For the 2018/19 tax year, if you earn above £46,350, the excess is taxed at 40% - ouch! However, there are some ways in which you can manage the amount of income tax you pay. Sounds interesting – right? One of the most effective ways of managing your income tax liability is to utilise what’s called your ‘annual allowance’. Your annual allowance relates to the amount you can contribute to your personal pension and receive tax relief. •	An additional rate tax payer £55 - tax relief of £20 will be given and an additional £25 claimed. Tax relief? This is an amount that is added to your pension contribution by the government. The amount received is based on your marginal rate of tax – so if you’re a higher rate tax payer, you will effectively receive 40% relief on your contribution. In simple terms a £100 pension contribution will cost: •	A basic rate tax payer £80 – tax relief of £20 will be given. If you would like to talk to one of our experienced Financial Planners about utilising your annual allowance before the end of the 2018/19 tax year, then please contact the office on 01778 342291 to arrange a FREE initial consultation. But be quick – though technically you only have until the start of April to take advantage of this tax year’s annual allowance, you will definitely need to come and see us sooner!!! he most famous secular building in Bourne is the Elizabethan style Red Hall that has survived several attempts to pull it down but is now protected by a Grade II* listing. It was built in 1605 by Gilbert Fisher, a London grocer, who wished to pursue the life of a country gentleman and who used locally made red bricks for the construction which give the property its distinctive name. For the next 100 years, the building was subjected to the daily vibrations of steam locomotives and freight wagons rumbling past and miraculously, it has survived without serious damage but when the railway station closed in 1959, local councillors were almost unanimous in their decision to pull it down. The building was also offered to the National Trust for safe keeping but the offer was refused. Mr Fisherâ&#x20AC;&#x2122;s dream home, however, ruined him because he spent so much in the process that he died in debt although his descendants managed to live there for almost a century followed by the Digby family whose tenancy led to the mistaken belief that it was used by conspirators of the Gunpowder Plot to blow up the Houses of Parliament. The hall subsequently stood empty and neglected for several years until 1962 when Bourne United Charities acquired the freehold and after a prolonged period of refurbishment funded by grants and donations, the building was restored to its original glory for use as a museum and community centre and its colourful exterior remains a tourist attraction, frequently photographed by visitors and even used as a location for film and television dramas. Lady Catherine, as she became known, went to live there as a young bride, having married the owner, James Digby who was thirty-seven years her senior, and she spent her time creating a fine garden around the house which she loved. James died in 1811 and Catherine, the last of the Digbys, in 1836 when the Red Hall became a private school until 1860 by which time the railways were arriving in Bourne and it was sold for use as a booking office and home for the stationmaster with a connecting footbridge to enable passengers to reach the platforms. There is a tale that the Red Hall is haunted by the ghost of a grey lady who flits through the rooms of this 17th century mansion on moonlit nights. Stories of the apparition have persisted over the years and for those who do believe in ghosts, perhaps it is that of Lady Catherine who was so reluctant to leave. Archive photograph of the Red Hall in 2010 by Rex Needle. It is now commonly agreed amongst economists and the general public that the dramatic rise in Bourne property prices of the last six years has come to an end. So, let me share with you what, exactly, is happening in the Bourne property market, and more specifically, who is moving and why in Bourne. The majority of sales in Bourne during the last twelve months were detached properties, selling for an average price of £276,700. Semi-detached properties sold for an average of £185,300, with terraced properties fetching approximately £176,900. So, whatever is happening in the world with Brexit, Trump, China, and the Stock Market … the Bourne housing market is in decent shape for the medium to long term. If we do have small corrections in values in the next 12 to 18 months, in the long term, house prices have always returned ... and returned with vengeance. Like I say to anyone buying a property, be they a first-time buyer, landlord or homeowner ... property is a long game ... and if you play the long game, you will always win! A new crackdown on scammers has been launched across Cambridgeshire and Peterborough with the aim of making the county scam-free –and Safe Local Trades is delighted to be supporting it! The Cambridgeshire and Peterborough Against Scams Partnership (CAPASP) is committed to working towards stamping out scams; from postal to online fraud, to telephone scams and doorstep rogue traders. Over the next few months, we will be looking in more detail at these scams and the warning signs which could prevent you from parting with your hard-earned cash. So, postal scams … what are they are how can we spot the signals? An official-looking letter drops through the door – you open it and to your delight and amazement you have won a substantial amount of cash in a prize draw, or have been left a large sum in a will. The letter instructs you to share your personal and bank details so that the money can be paid directly into your account. What do you do? That glossy catalogue landing on the doormat is selling ‘miracle’ diet supplements, and that oh so accurate letter from the experienced clairvoyant has got your first personal reading spot on, but you need to pay for a follow-up. What do you do? All these seem too good to be true – free money, a better future and a new, improved you! That’s because they are; in fact these are some of the clever postal scams currently causing misery to people locally and further afield. The correspondence will look ‘official’ – cleverly designed to fool the recipient; often with lots of attention to detail. Some tell-tale signs include: • Requests are made for money first, before getting the prize. • Use of the customer’s first name to make the letter look personal. • The letter is written to put people under pressure to reply. • PO boxes are used, instead of a full postal address. • ‘Too good to be true’, dazzling offers. • A director’s name, picture, signature and stamps are used to make it look official. • Fake testimonials or money-back guarantees are often used. • The letter often asks the recipient to keep their winnings a secret. ADVICE Don’t reply to unsolicited mail e.g. lotteries and prize draw letters – instead, either return to sender, or send it to the Royal Mail at FREEPOST SCAM MAIL. Do sign up for FREE to the Mailing Preference Service (MPS) at www.mpsonline.org.uk or on call 0845 703 4599; this will help stop sales and marketing mail from within the UK. If you think you, or a loved one, may have been the victim of a scam, report it to Action Fraud. To find out how you can sign up for the fight against fraud, and read some tips on spotting a scam, visit www.friendsagainstscams.org.uk. In addition, Safe Local Trades has its own advice on tell-tale signs of a lottery, prize draw or sweepstake scam. Please visit our website www.safelocaltrades.com/consumers/advice/ common-scams-lottery. A Meal Ticket for Life? The concept of ongoing spousal maintenance, normally by an ex-husband to the ex-wife, has not existed as a principle in divorce cases for many years. To the contrary, the Courts actually have to strive to achieve a clean break in financial orders, as much as it is reasonably possible. Nonetheless, there are sometimes circumstances where it would be completely unfair to cut a wife adrift from all future financial support if, for example, she has spent decades, by mutual agreement with the husband, as a mother and housewife and does not have the qualifications or experience in the workplace necessary to get a job. More changes are afoot, and not to a wifeâ&#x20AC;&#x2122;s advantage. The Divorce (Financial Provision) Bill which is in its final stages in Parliament, proposes a five year cap on any spousal maintenance, save for exceptional circumstances. This is the handiwork of the crossbench peer, Baroness Deech, who has long opposed ongoing divorce payments. Your local family law solicitor would not agree with this proscriptive approach. If you want to know more about these changes, contact a family law specialist to find out. tutors to bring a varied range of classes, including calligraphy and pyrography, along with their popular card-making, scrapbooking and jewellery-making classes. Donna is a regular contributor to jewellery-making magazines, and last year self-published her first guide to kumihimo, a popular jewellery-making technique with origins in Japanese tradition. She is also a regular guest on the Create and Craft television channel, and can be found at craft shows around the UK. Riverside Beads and Crafts are open seven days a week, including Bank Holidays! For all your craft, art, haberdashery & beading materials, along with lots of other craft materials! 30 March - 8pm £16.00 / £15.00 Conc. The Uk’s No.1 Tribute to the Live Performance & Sound of The Jam! Join Neil Sands for two hours of nostalgia and good old fashioned fun. 13 May - 2pm £11.00 / £10.00 Conc. Church 9.30am - 12noon. Come and enjoy lovely homemade pancakes and a chat - everybody welcome. is standing at £325 if it’s not already been won! - An Evening of Mediumship at Wake House,41 North Street, Bourne, with speaker Ewa Thorley - 7.30pm start, £5 entrance- raffle extra. All welcome. All profits go to local charities. Veira, 7.30pm at The Corn Exchange, Bourne. Jonathan entertains with unique songs and stories, breathing new life into worship songs. Tickets from Sally Anne’s Charity Shop £10. - The Rotary Club of Bourne St Peter’s Annual Afternoon Tea 3pm – 5 pm in the Bourne Abbey Church Hall. Tickets £8 per adult, £4 children (12 and under), £20 family ticket (2 adults and 2 children under 12). Phone Janice Hill for tickets 07972211936 or 01778 440733. March 9th and 10th - Southern Steam Gala: Guest locomotives, (‘Terrier’, 662 Martello and ‘Schools class’, Repton) will join resident locomotive, the magnificent ‘Battle of Britain Class’, 92 Squadron, for this weekend. Expect multiple running and the chance to ride behind, all for one fare. March 23rd and 24th - Open Weekend: Free admission to Wansford and Overton stations. Get behind the scenes of the NVR, visit the workshop, signal box and more for free. - Prize bingo at Aslackby Village Hall. Doors open at 6.30 pm - eyes down 7.00pm. - Churches Together in Bourne invite you to their Lent Lunches from 12 noon till 1.00pm at The Methodist Church, Bourne. Preceded by the Lent Course, “Daring to see God now” at 10.30am. More information from Roland 01778 393580.
in conjunction with Macdonalds: an opportunity to help clear the wood of litter before the spring. Starting from the car park at 10am, all ages are welcome. Please call Sarah on 07760 468052 in advance if you are planning on coming along to ensure we have enough pickers, etc. 17th - Quiz Night at the Masons Arms, £1 entry, and the jackpot is standing at £330, if it’s not already been won! who will be talking about “Deene Park -House and History.” Commencing at 2-15pm, doors open at 1-45pm at Bourne Corn Exchange, admission £1. New members and visitors are always welcome. If you wish to know more, ring 01778 425 786 or visit www.u3abourne.org.uk. refreshments (wine available - donation). To be held at Bourne Elsea Park C of E Primary Academy, Sandown Drive. Charity raffle: Fabulous prizes to be won on the night! Ex High Street fashion at 50% or more off - all types of payment taken. For tickets and more information, please contact: Beth, Maya or Nicola at Cafe 35, 35c North Street, Bourne PE10 9AE or Terry Westwood: - 01778425996 / 07912624313. Doors 6.30pm, show starts 7pm. difficulties to spend time singing and playing simple instruments together at The Salvation Army, Manning Road, Bourne, 10.30am to 12 noon. All of those interested are welcome to come along and see what it’s all about. at Lawrance Park, Thurlby: start 7-30pm, dancing to the Cross Keys Band. Tickets £10, from John 01778 424717, to include supper -please bring your own drinks. - Table Top Sale and coffee morning at Bourne Corn Exchange, doors open to the public at 9-30am. Come and enjoy filled rolls and home-made cakes, all proceeds to the NSPCC. To book a table, phone Audrey on 01778426487. 7.30p.m. in the Darby and Joan Hall, South St. Bourne with demonstrator Tim Meakin: his theme is entitled, “Having fun with flowers.” This is the start of an exciting new year as they are celebrating 35 years of their founding. Visitors and new members always welcome. 30th - Monthly Coffee Morning - 10.00am to 12noon at The Salvation Army, Manning Road, Bourne: a great time to enjoy bacon butties, toasties, tea and coffee with sales tables to browse. 31st - Quiz Night at the Masons Arms, £1 entry, and the jackpot is standing at well over £320, if it’s not already been won! - Mugjugglers at the Masons Arms - 9pm start. Barholm with Pennyless, start 8.30pm. Antoine at The Masons Arms, Bourne. 17th - Open Mic at the Five Bells, Haconby Lane, Morton, Bourne - 2pm to 5pm - details: Rick and Annette 07827953252 or Dean 07595-219357. - Night Fuel at the Masons Arms tonight at 9pm. Hall, 1-2 Roman Bank, Bourne, Lincs PE10 9LQ. First class country singers from around the UK, this month Nadine Somers: whether you’re a line dancer or a listener, these evenings are for everyone who appreciates good Country music. Entrance £9, no bar, so bring your own drinks. For further information, phone Donna 07718972329 or e-mail DCALiner@aol.com. 3rd - Open Mic : 8pm at the Hare and Hounds, West Road, Haconby, Bourne, PA and soundman provided. For further information, phone 01778 571428. 7th - Pennyless at the Hand and Heart, Peterborough : 8.30pm. 7th - Jazz at The Toft House Hotel at 8 00 pm. Stamford Jazz Music Society presents The Toft House All Stars. Admission £10, booking advisable, 01778 590335. Hounds, 2 West Road, Haconby, (3miles north of Bourne) hosted by Pete Shaw and friends (some music available if you contact in advance) - 01778 571563 or pete@ peteshaw.co.uk To book a 6pm meal with the pub before the session, phone 01778 570521. Hall. The Bookshop Band, Beth Porter and Ben Please write songs inspired by books ranging from Shakespeare to Philip Pullman and many in between. Beth is a renowned cellist, composer and arranger and Ben Please, the other half of the Bookshop Band and Beth’s husband, co-writes and performs on guitar, ukulele and vocals. Tickets at £10.00 adult, £5.00 11 -18 and free for under 11 available from 01778 570370 or rexcons@aol.com.You can see more at www.thebookshopband.co.uk. 29th - Local four-piece covers band, The Great Pretenders, at the Masons Arms Bourne tonight at 9pm. 30th - Another local band playing at the Masons Arms, Splinter Group: 9pm start. the Hare and Hounds, West Road, Haconby, Bourne. 8pm start. For further details, phone 01778 425422.
a mural, designing a new logo and creating a garden sensory path. Little by little, what was once a cluttered residential bungalow became a bright, modern, comfortable childcare facility, with a baby room referred to as The Nest and an art studio and a two-storey role play area for the older children in The Sky Room, as well as a garden rich for exploring. Sarah is keen to maintain the “home-from-home” feel at the nursery with re-purposed vintage furniture, natural materials and cosy sofas and rugs. This homely atmosphere is enhanced by the provision of hot meals made from scratch by staff in the new kitchen. As the weather improves, staff also hope to grow vegetables in the garden with the children for them to eat. The feedback about the new building from parents and teachers alike has been overwhelmingly positive, praising Sarah’s vision for the setting and the “beautiful”, “calming” and “cosy” atmosphere she and the staff have created. “It’s just a lovely space for little people,” one mum enthused. Thurlby Pre-school has long been seen as a high quality, teacher-led, early years’ provision which has been valued by families in Thurlby and neighbouring communities for being a small, friendly and happy learning environment where children can readily access the outdoors and participate in rural village life. Swallow Hill Nursery is continuing that legacy for the next generation. There are a few places still available. Please call Sarah Austin (01778) 394250 or e-mail enquiries@ thurlbypreschool for more details, or to arrange a visit. Photographs of the setting can be seen on the Swallow Hill Nursery Facebook page. Nursery Continues to Build Strong Links with the Community From September 2017, Headstart Nursery in Bourne began taking their Pre-School children to the local care home. During these visits the children took part in some brilliant two-way activities and really built some excellent relationships with the staff and the residents. visits to the ‘Ginger Fox Café’ where they bring their pennies and buy themselves a drink and a biscuit. The children have also visited the local market and bought some fruit and vegetables for their role play area, and walked to the bus stop and went on a short bus ride. This year, Headstart really wanted to extend this and provide as many opportunities as possible to interlink with the local area and to become a part of the community themselves. In the upcoming months, Headstart are looking at paying regular visits to the library for a ‘Storytime’ and, following the success from last year, are also looking at hosting another Family Fun Day , that would be open for all families to attend. Blood Testing Older Pets Taking blood samples from humans and animals is routine nowadays and can give a good insight into the health of your pet, especially our ‘senior citizens’. Dogs and cats over the age of eight (or five for the giant breeds) are considered to be ‘senior citizens’ and we expect them to start slowing down. They tend to sleep more and are less playful. But there could be other reasons why your pet may be slowing down. The most obvious is arthritis and joint disease. Wear and tear over the years can cause damage to protective cartilage covering within joints. The discomfort stimulates the body to produce inflammation around the joint and bony growths to try to fix the joint in position. Your pet initially feels pain and discomfort and the joint begins to seize up with a reduced range of movement and flexibility. There are many new drugs available to ease the discomfort of arthritic joints and finding the most suitable one for your pet is often a case of trial and error. However, when pets are relieved of this pain, owners often report a very noticeable difference in their pet’s attitude and ability to exercise. The anti-inflammatories will not take away excess bone growth and your pet may still hobble, but he’ll be in a lot more comfort. Routine blood testing in older animals is also very useful for the early detection of disease. A small sample sent to the lab can reveal a lot about your pet’s health. Blood smears tell us about blood counts. A reduction of red blood cells and the oxygen-carrying protein (haemoglobin) they carry, is known as anaemia. But this is only a symptom and the pathologists at the lab can help us determine the cause of the anaemia in the first place. An increase in white blood cells can certainly be due to infection, but changes can also be due to stress, drugs, parasitic disease and cancers of the bloodstream and a pathologist’s interpretation is very important here too. Biochemistry of the blood informs us of the workings of the internal organs, whether the kidneys, liver or thyroid organs are functioning as they should. Early detection of change within these organs means that investigation of disease and treatment can begin, and there is a better chance of curing the disease or slowing the rate of deterioration. Often a urine sample is needed as well, and this can be tricky for owners to obtain. A small foil tray, that has never had sugar in it, slid underneath a dog as it is peeing can get enough for testing, (usually a teaspoonful is plenty). Cats can be a lot harder and we have artificial litter, in the form if tiny non-absorbent plastic balls, that can be used in place of normal cat litter. Hopefully, routine testing on the older pet will find no problems at all, but having that peace of mind is well worth a thimble-full of blood. Alto Electrical is a family run local business, offering a friendly and professional service that you can depend on, from contact to completion. If you would like any electrical advice or would like a free consultation, please call the office and we will be happy to help. Get Peace of Mind before you buy... Gowers Surveyors are a local independent firm of Chartered Surveyors and Chartered Building Engineers, specialising in Period Property Building Surveys. We will provide you with a professional assessment of your prospective purchase so you are fully aware of what you are buying. Time For You House Cleaners – “Life is Too Short to Spend it Cleaning!” • There is ongoing Need a reliable support from a cleaner … but don’t professional, helpful know where to start? team. Talk to “Time For You”! • Weekly (2 hours Finding a good, minimum) and fortnightly reliable and cleans (3 hours trustworthy cleaner to Esther (Cleaner minimum). clean your home can Recruitment), Jo feel like a daunting (Director), Pauline • We are insured for task. Alternatively, you (Operations accidental damage. may already have a Co-ordinator) “Time for You House cleaner, but realise Cleaners” is owned by Jo you need a service offering an Morgan-Walters, an ex-teacher alternative cleaner when the who started the business in 2003. regular cleaner is on holiday or is ill. While Jo is out meeting clients and Why do over 500 homes interviewing cleaners, her busy throughout Lincolnshire and office in Market Deeping is run by Cambridgeshire already choose a well-established team. So, when us? you call “Time For You”, you may well speak to Pauline or Esther, call • We select the right cleaner for 01780 671071 or 07434 952933 to you according to your needs. • You have the same local cleaner find out more and see our website for testimonials: each week. Stamford-bourne@timeforyou. • All cleaners are interviewed co.uk or www.timeforyou. in their own homes and their cleaning credentials checked. Let me assist you with your problems. Virus removal to full re-builds. Upgrade work undertaken. Extensive range of new and used equipment.